On the "foundation for all future dictatorship"
"Extreme Prejudice" as a military/intelligence term refers to a person marked for destruction, a usage not inappropriate here. 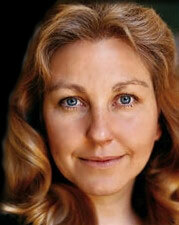 Susan Lindauer, the second cousin -- and eventual victim -- of George W. Bush's chief-of-staff Andrew Card (and others), is an anti-war and anti-Iraq-sanctions activist. Bur she was also the "backdoor" intelligence Asset for the U.S. government, under handlers from the CIA and Defense Intelligence Agency, for communication with the Libyan government regarding the Lockerbie plane bombing (they didn't do it), and with the Iraqi government in the year prior to 9/11 and in the lead-up to the Iraq War. She had come to the intelligence community's attention for having earlier passed on a warning -- unheeded -- about the 1993 WTC bombing. Throughout 2001 she personally communicated to the Bush administration a series of increasingly specific and frantic intelligence warnings about an impending attack in NYC involving hijacked airplanes and the World Trade Center. She was also the backdoor negotiator with the Iraqi regime over "WMDs," and had managed to obtain Iraq agreement with all U.S. demands, only to have that agreement ignored and suppressed by an administration intent on war. Angered by the administration's and Republican leadership's subsequent attempts to blame 9/11 and the eventual Iraq quagmire on the failure of the intelligence community to provide adequate intelligence, she went to Congress to lay out what she knew, and was promptly arrested, accused of being an Iraqi spy, and eventually sent to prison for "psychiatric evaluation" and an attempt at stereotypically Stalinist forced drugging. 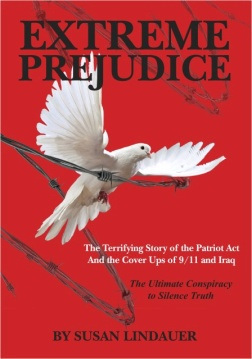 Extreme Prejudice is the story of the events involved in the role she played prior to her arrest, and the ghastly Kafka-esque story of the years of torment that followed, orchestrated by the Patriot Act and the judicial system corruption and fraud it has facilitated. The book is a wakeup warning call to Americans about that Act and the destruction of our basic freedoms it represents. As an author, Lindauer leaves much to be desired. Extreme Prejudice appears on the surface to be the epitome of unedited self-publishing by an author very taken with herself and given to endless repetition of certain themes -- to the point where I ended up skip-skimming text to avoid them. Which is not to say that she isn't an incredibly brave and determined person who fought an incredible battle against forces one is tempted to call an "ultimate evil," nor that the repeated themes aren't vital aspects of her story. In her role as a Cassandra, she has a justifiable right -- even duty -- to lay them out as she sees them. Hyperbole is certainly not inappropriate in her case. But knowing what to omit is the mark of a good author. Nevertheless, I was willing to struggle through all that, partly because her story is extremely compelling -- a thriller with all the increasingly vicious attacks, double-crosses and cliff-hangers one could ask for (she's good at that) -- and partly because she illustrates in painful and vital detail the byzantine Catch-22 way in which the Patriot Act has turned to ashes the legal system that Americans assume protects them from an authoritarian police state. A government of laws in which all laws and legal practice are treated as exceptions is not a government of laws. As I read through the book, I marked a number of places of substantive interest to me, though by no means all of them. Those places represented a generalization of her specific case to the larger world that will be affecting all of us. The following are quotes from the text at those places. I do not mean to imply that there are no other equally important or interesting points in the book -- there are many (especially on court psychiatry and prisons, Carswell in particular), which is why it is such important reading. I hope these whet your appetite. Sanctions reduce entire nations to struggling poverty, with long term consequences that harm the rise of new markets for U.S. goods. In that sense, he showed me how sanctions cripple economic prosperity for trade partners in both directions....Sanctions lay barriers to quid pro quo solutions, which are vital to breaking deadlocks, in favor of "all or nothing" solutions, which are most difficult to attain. Very serious conflicts continue to fester without relief, as a direct result of sanctions policy. Free thinking leads to criticism of government policy. Criticism must be treated as a threat to the functioning of the State, and crushed when necessary to protect the elite. In short, the Patriot Act lays a road to the Gulags. Most Americans don't understand -- yet -- that it creates a judicial framework for fascism, and the beginning of all dictatorship in America. In the shadowy world of the Patriot Act, I was never allowed to know which man -- Andy Card or Colin Powell -- filed the original complaint against me. Under the Patriot Act, the superior power and social standing of both men afforded them additional rights over mine, such as protection from being exposed as my accusers. They could lie and hide, and I still faced punishment, though I demanded my right to confront them in open Court. That sort of consideration, based on the greater political access of one's accusers, rings ominously similar to the legal system of China or the former Soviet Union. It's the prerogative of dictators and their collaborators. It is decidedly prohibited by the Constitution of the United States. ...in five years of indictment, my legal team was never allowed to read a single one of the FBI witness interviews or grand jury statements. Under the Patriot Act, we had to take the Justice Department's word for everything. The grand jury essentially functioned as a "Star Chamber." My case shone a klieg light on how the Patriot Act damages essential protections in a courtroom, regardless of the U.S. Constitution. Courtroom proceedings were scattered with "secret evidence" and "secret testimony." I lost the right to face my accusers at a public trial or hearing. I got none of that. The Justice Department invoked the Patriot Act to declare that some unidentified action occurred on October 14, 1999, which violated some unidentified law -- That's all we got to know. The Justice Department was quick to inform the Court, however, that conviction of either of those "secret charges" would catch me five years in federal prison. If that was not Kafkaesque enough, the Patriot Act relied on "secret evidence" to justify those "secret charges." Quite literally, the Prosecution had the right to ask a jury to convict me of "secret charges," without revealing any evidence whatsoever that the alleged criminal misdeeds even occurred. The Prosecution had no obligation to provide a shred of evidence that I engaged in the actions, let alone demonstrate why they rose to a level of criminal behavior that deserved prison time. The Patriot Act requires a jury to "take it on faith," because the Prosecutor says so. Grand jury testimony was "classified" because it involved public officials. The Justice Department barred it from my sight or use in pre-trial proceedings, even though it should have authenticated my claims that I worked as an Asset, and resulted in the immediate dismissal of the major charges in my indictment. I would have been saved. Yet as a defendant, I was prohibited from receiving it or using it. Stacking the deck against me even more, the Patriot Act authorized the Prosecutor to submit papers "in camera" to the Court -- for the Judge's eyes only. My attorney would not be allowed to receive copies of the Prosecutor's submissions to dispute them. The Justice Department has no obligation to acknowledge that an "in camera" submission has been made. Alas, one crucial mistake would cost me everything. I trusted the integrity of psychiatry... I did not understand the corrupt practice of psychiatry in the courtroom. Learn from my mistakes, people, and remember these few tips. These suggestions might save your freedom and your reputation some day. If only somebody had warned me, I could have protected myself. These simple rules apply to everything from criminal cases to custody battles. Rule number 2: Always take a tape recorder. Never attend any psych evaluation for any reason without a recording device. My case is littered with examples of psychotic shrinks inventing things. They'll tell you straight up -- "It's my word against yours. Who do you think they're going to believe, you or me? I'm a doctor."... It's OK if [the psychiatrist] wants a copy of the tape. But you must forbid the psychiatrist from hading it over to the Prosecution or spousal attorney in a custody case. You have protections under the 5th Amendment. Specify on tape at the start of the interview that you would appeal to the Higher Courts to stop the Prosecution from violating your rights against making forced statements to its surrogates. And you reject any request to share that tape. If your attorney overrides you, you'll file a complaint to the Bar Association. Get that on tape! Rule number 4: Never meet a Prosecution psychiatrist outside the presence of your attorney. Their job is to screw you. That's what they've been hired to do. Everything you say ends up with the Prosecution. If there are topics you want to avoid, you have every right to refuse to discuss them. Do not present your defense...Always invoke your 5th Amendment rights under the Constitution. Unless you're pleading guilty, refuse to answer questions regarding events tied to your alleged crime. They will try desperately to compel or manipulate you to talk...If your attorney attends the interview, he can stop a psychotic shrink from asking the same question twenty times, which they will do. It means they don't like your answer, and they want you to say something different, so they can twist it...[Say] "We've already discussed this issue. Do you have any other questions? Or shall we end the interview?" Rule number 5: If something's off topic, don't discuss it. The simple response is, "this matter has no relevance to the current legal situation. I'm not going to discuss it. If you're going to pursue that line of questions, then we're finished with the interview. Are there any other topics, or are you done?"... They're fishing... Keep your comments to the barest minimum. And remember that you don't have to answer their questions. Rule number 6: Never presume that a psychologist who appears reasonable and benevolent in discussing your life is actually rational in their own thinking. Psychology can attract individuals who are seriously disturbed in their own lives. A court-ordered psych evaluation is a power trip. They think they look important if they're screwing people. It sounds unbelievable until it happens to you. That's why you must get it on tape. Going into an evaluation without some form of recording device could be the greatest mistake of your life. It could destroy you. "Warrantless searches" on the Patriot Act posed the least of my worries, though they excited the most public outcry, and I endured at least two. By far the scariest part of the law pertained to "secret evidence." "Secret evidence" laid the ground for two "secret charges" in the indictment. If I had a possible explanation, it would be meaningless to share with my attorney. In all likelihood, he would not know the nature of those "secret charges" either. For all that, it was dawning on me that "secret evidence" on the Patriot Act carried an even more frightening and onerous burden that I had not previously understood. "Secret evidence" that established my innocence and might save me from years in prison, called "exculpatory knowledge," got withheld from the Court, too, including all important confirmations of my work as a U.S. Asset in anti-terrorism for nine years, supervised by U.S. intelligence! And the Justice Department greedily withheld validation of that truth. They simply declared it "classified evidence" and refused to acknowledge it. My case was non-stop legal fraud -- a reflection on Washington's desperation to silence me. They succeeded for so long because of the Patriot Act...the Patriot Act handicapped even the most senior attorneys. The Patriot Act changed the equation of power in the courtroom, such that all transparency in the proceedings got erased. It emboldened the Prosecutor to misrepresent the caliber of evidence against me, when the charges should have been dropped as frivolous. As time went on, protecting the lies invented on Capitol Hill required yet more abuse of my rights, and more deceptions to safeguard Republican officials from exposure. It's why I call the Patriot Act the foundation for all future dictatorship in the United States. It's a very dangerous law. My case demonstrates several critical reasons why the Patriot Act should be repealed immediately. Every leader who supported the Patriot Act should be removed from power, Democrat or Republican, without exception. The Patriot Act should be a litmus test for judging who's qualified to protect the best traditions of democracy in our country, and who's unfit for leadership. It's that bad.